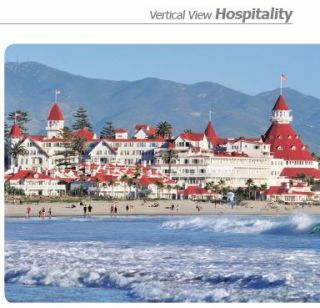 Next year will mark the 125th anniversary of the Hotel del Coronado in Coronado, Calif.
For such a milestone, hotel management wanted to celebrate with a technological upgrade to the beach resort: one that would blend the hotel’s rich history with modern digital communication. Management decided to incorporate digital signage screens to provide guests with wayfinding and information on the property, hotel amenities, local attractions and real-time promotions. To create the digital signage network, they turned to Arizona-based Audio Visual Source (AVS) and X2O Media’s Xpresenter platform. The project had a number of requirements. First, each wayfinding display needed to show a large, detailed map of the resort at all times, while still maintaining interactivity and space for other content. The property is very expansive, consisting of 28 oceanfront acres. Large detailed maps were needed to provide guests with a complete view of the resort for wayfinding. AVS and X2O Media devised an innovative solution to this issue: dual-screen touch wayfinders. Each wayfinder consists of two side-by-side displays that are driven by one Dell PC: one touch monitor for interactivity and one non-touch monitor for a constant detailed map. AVS installed six dual-screen touch wayfinder screens across the property: in the Ocean Towers, the California Cabana, the Main Lobby, the Babcock & Story bar and the Grande Hall and on the north side of the property near the Garden Patio. An additional 38 meeting room signs were installed outside the entrances to all conference spaces, and one of the guestroom television channels is dedicated to digital signage content. Each dual-screen touch wayfinder screen provides information on current conferences and meeting spaces; videos about dining, recreation, shopping, the spa and salon, and guestrooms; and concierge services such as local attraction tickets, transportation, and childcare. 3-D wayfinding directional maps guide visitors to their destinations and can be emailed to their smartphones for convenience. Live-data feeds provide access to real-time weather and flight information, while PowerPoint slides keep guests informed of daily resort events. Each screen also includes a customizable ticker featuring promotions, resort highlights and announcements. The meeting room signs provide a listing of current hotel groups/conferences, meeting times and locations, and “now and next” usage information for each room. Customizable tickers display news feeds and information on the resort’s amenities. The dedicated guestroom channel offers event start and end times, in addition to real-time weather conditions with animated graphics. Additional requirements for the digital signage network included providing visitors and guests with a simple and easy way to access additional information on hotel amenities—such as spa treatment and dining menus—by using their smartphones. Management also needed to be able to update content quickly on the screens in the event of a change to a group meeting. This ability to provide real-time information would not only let the staff avoid the time-consuming process of reprinting and distributing paper signs, but it would increase visitor satisfaction by ensuring they always have the most current information. The interactive wayfinders, meeting room displays and in-room TV channel are all driven by X2O Media’s Xpresenter digital signage platform. Having only one platform to manage all these different types of displays saves the staff time and effort. Xpresenter integrates seamlessly with the Delphi hospitality software, ensuring that displays are always up to date with the latest meeting information. It also allows guests to access more information on hotel services by dynamically displaying QR codes. Guests simply scan the QR codes on the displays with their smartphones to access digital content, which they can take with them. The digital signage network went live in April 2012, and it has quickly proven to be a valuable tool in relaying meeting, property and amenities information in a dynamic visual format, and in a more efficient manner. Hotel staff can track the use of specific QR codes, the results of special offers placed in the customizable ticker and other regions of the screen, and the number of maps emailed to users’ smartphones. The data shows that a very large percent of guests are not only using the wayfinding screens, but are emailing maps to their phones. In the future, the hotel will push the capabilities of the network even further by incorporating even more interactivity. In particular, near field communication will allow the hotel to communicate and receive consumer information for marketing and promotional purposes. In addition, the hotel will be able to display real-time social media content on the wayfinder screens. For guests, this will take the high-tech experience at the Hotel del Coronado to the next level.